Have you always wanted to give your family a dream lifestyle? Your heart will skip a beat as you cruise down your private driveway and get a glimpse of your new home, a country style home - set on park like grounds with the gracious old trees framing the horse arena with stable, tack room, and 5 post and rail/equine fencing completes this gorgeous 4 acre property. You will really appreciate the space of the home on offer, with three bedrooms and two Bathrooms. Enjoy those long summer nights sitting on one of the decks, wrapping around the front and back of the home. Dusk really is a sight to behold with the sun spilling through the trees and the peacefulness of the property, with little noise to distract. The vendors have thoroughly enjoyed living at 175 Tiverton Downs and have spent time over the past few years lovingly caring and developing the property to its current beauty. Due to owners change of circumstance they are committed to move - an urgent sale is required. 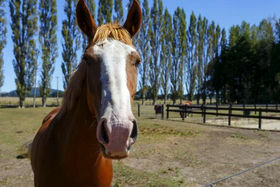 Call Anna or Team Leo urgently 0800 LOVE TAUPO.